Roland SBX-1: the device formerly known as Sync Box. First seen at Musikmesse 2014 with a big 'Sync Box' label on it, Roland has officially unveiled what we now know is the SBX-1. 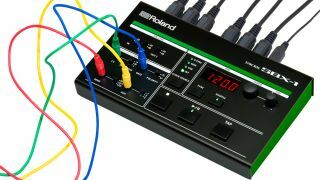 Part of the Aira range - the black and green colour scheme gives the game away - this is designed to let "computers and electronic instruments communicate and synchronize with each other". It supports DIN SYNC, MIDI and USB devices, any of which can be used as the master clock source. You can also use the SBX-1 as the 'master sync'. It has its own internal clock, and you have hands-on control over the timing and groove. There's support for CV/Gate, too. You can find out more about the SBX-1 on the Roland website, where you'll also see diagrams that show how you can use it to make your digital and analogue gear play nice together. Price and release date are TBC, but we'll bring them to you as soon as we can.